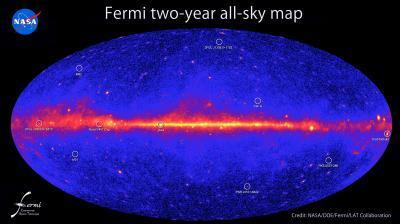 Every three hours, NASA's Fermi Gamma-ray Space Telescope scans the entire sky. Every year, the satellite's scientists reanalyze all of the data it has collected about the high energy universe. A few months ago, the Fermi team released its second catalog of sources detected by the satellite's Large Area Telescope (LAT), producing an inventory of 1,873 objects shining with the highest-energy form of light. "More than half of these sources are active galaxies, whose massive black holes are responsible for the gamma-ray emissions that the LAT detects," said Gino Tosti, an astrophysicist at the University of Perugia in Italy and currently a visiting scientist at SLAC National Accelerator Laboratory in Menlo Park, Calif. "What is perhaps the most intriguing aspect of our new catalog is the large number of sources not associated with objects detected at any other wavelength." If Fermi results alone were our recipe for how to make a universe, the two major ingredients would be active galaxies and...well...mystery. Add in some pulsars, some supernova remnants and a few globular star clusters and galaxies like our own Milky Way and there you have it. Clearly that mysterious X is important. Astronomers delight in the possibility of finding new types of gamma-ray-emitting objects within the "unassociated sources" that constitute roughly a third of the Fermi catalog. 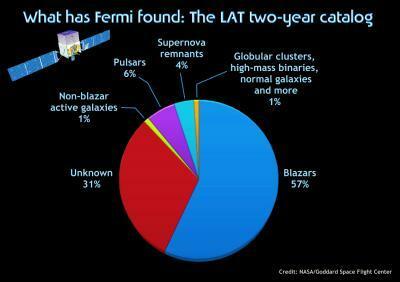 But Fermi's LAT is revealing gamma-rays from an increasing -- and sometimes, surprising -- variety of astronomical objects. To highlight the range of LAT discoveries, the Fermi team created the following "top ten" list of five sources within the Milky Way and five beyond our galaxy. W44. Another interesting supernova remnant detected by Fermi's LAT is W44. Thought to be about 20,000 years old -- middle-age for a supernova remnant -- W44 is located about 9,800 light-years away in the constellation Aquila. The LAT not only detects this remnant, it actually reveals GeV gamma rays coming from places where the remnant's expanding shock wave is known to be interacting with cold, dense gas clouds. Centaurus A. The giant elliptical galaxy NGC 5128 is located 12 million light-years away in the southern constellation Centaurus. One of the closest active galaxies, it hosts the bright radio source designated Cen A. Much of the radio emission arises from million-light-year-wide lobes of gas hurled out by the supermassive black hole at the galaxy's center. M82's central region forms young stars at a rate some 10 times higher than the Milky Way does, activity that also guarantees a high rate of supernovae as the most short-lived stars come to explosive ends. Eventually, M82's superpowered star formation will subside as the gas needed to make new stars is consumed, but that may be tens of millions of years in the future. For now, it's a bright source of gamma rays for Fermi.